(1). Dingsdale Perpetual Trophy – Awarded to the rider returning the best average speed in the 10, 25, 50 and 100 mile time trials on Cheshire, Liverpool and North DC (J, D, L) courses. George Dingsdale had cycle shops in St.Helens and Haydock. Presented by G.Dingsdale Sen 1927. (2) Harry C. Barker Memorial Trophy – Awarded to the rider returning the fastest time in the H.C.Barker memorial 50. Harry was a Founder Member of the Road Club and a leading timekeeper. Presented by members and friends of the late H.C.Barker 1947. (3) Brown Trophy – Awarded to the first handicap winner in the H.C.Barker memorial 50. Presented by A.Brown Esq. (4) Derek Devonport Memorial Plaque – Awarded to the 50-&-Over winner of the Club’s Road Race. Derek was Club Treasurer and National Treasurer RTTC. Presented by J.Devonport 1998. (5) Crabtree Trophy – Awarded to the fastest first year road club rider over 25 – 50 miles. There used to be Crabtree Cycle Shops in Warrington and Widnes. Presented by Crabtree Ltd. Warrington/Widnes 1947. (6) Sherlock Trophy – Awarded to the highest placed club member in the BBAR competition. Bill Sherlock had a cycle shop in St.Helens and was a member of the Road Club. Presented by A.Sherlock & Sons 1950. (8) The P.Robertson Trophy – Awarded for the fastest 10 mile TT by a club rider. Pete was a strong racing member, holding two club tandem records with Roy Dixon for over 50 years. Presented 1986. 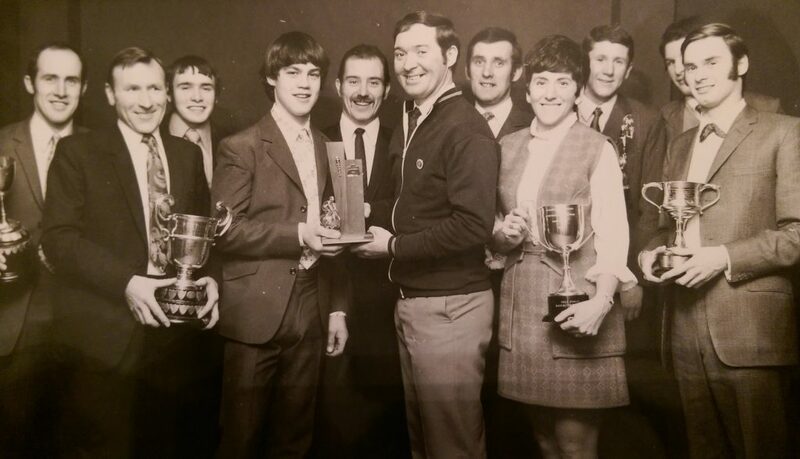 (12) Elin Trophy – Awarded to the club rider covering the greatest distance in a 12 hour TT. Presented by N.Lenton Esq. Championship winning team with Stan Lea and Arthur Turner. (15) Arthur Hall Memorial Plaque – Awarded to the fastest junior at 25 miles. Arthur was tragically killed at work age 20. Presented by his friends. (17) Skelton Trophy – Awarded to the lady rider returning the best average speed in 10, 25, & 50 mile time trials. Jack Skelton owned a cycle shop in Warrington. Presented by J.Skelton Esq. (19) Walter Pritchard Memorial Shield – Awarded to the best junior in road races throughout the year. Walter was a founder member of the Road Club (on 17th June 1923) and Treasurer from 1927 to 1947. Subscribed for by club members. (20) Meadowcroft Trophy – Awarded to the Club Rider with the highest number of points gained in open road races. Six points to be awarded for first across the line, down to one point for sixth place. This trophy was originally from the Merlin RC – Dave Meadowcroft was tragically killed whilst training. (22) The Veterans Championship Trophy – Awarded to the veteran club rider with the best two standard times from 10, 25 & 50 miles, added up for the best plus to win the championship on J-D-L courses only. Presented by T.Horton Esq 1997. (23) The Fullelove Trophy – Awarded to the Road Club rider with the most improved performances throughout the season. Arthur Fullelove was a member of the Road Club and had a tyre business in Warrington. Presented 1986. 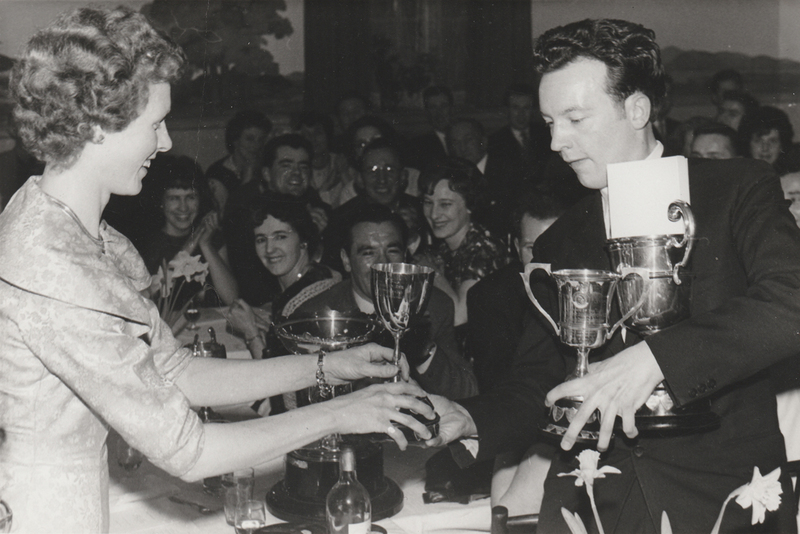 Guest of honour Joan Kershaw passing trophies to John Atkinson Club Dinner 1960.